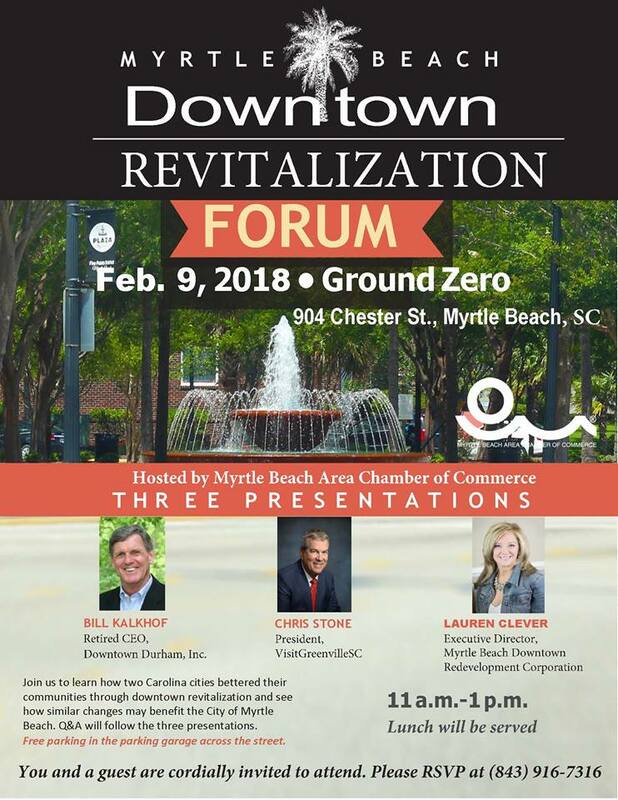 The Myrtle Beach Area Chamber of Commerce hosts the Myrtle Beach Downtown Revitalization Forum, 11:00 a.m. to 1:00 p.m., Friday, February 9, at Ground Zero, 904 Chester Street. The forum features a presentation by Bill Kalkhof (Retired CEO of Downtown Durham, Inc.), Chris Stone (President, VisitGreenvilleSC) and L...auren Clever (Executive Director, Myrtle Beach Downtown Redevelopment Corporation). The forum is designed to learn how Durham and Greenville improved their cities through downtown revitalization. A question-and-answer session will follow the presentations. To R.S.V.P., call 843-916-7316.